Paul Cleary replaces the unavailable Alan Grant as Derry travel to Carlow this weekend. aul Cleary replaces Na Magha forward Alan Grant as Derry hurlers face a tricky trip to Dr. Cullen Park, Carlow on Sunday still in search of their first league points of 2016. Breandan Quigley is still working his way back to fitness after injuring his back in the league opener against Antrim so Cleary’s inclusion is Tom McLean’s only change from the side that lost out to Westmeath. Despite those successive defeats, the Oak Leaf manager is happy with how things are progressing. Carlow will still be reeling from their 5-16 to 1-11 reversal against London but with the division’s top two teams, Antrim and Westmeath, meeting in Cusack Park this weekend, they will see this as a chance to get their promotion bid back on track. “Carlow will be a tough challenge, we are fully aware of that,” added McLean, “But the players have been working hard and have given 100% commitment and I’m very happy with how things have gone. 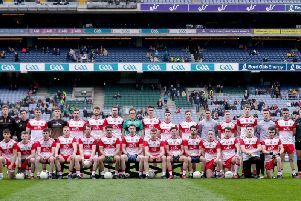 Derry have impresses in stages of both league games so far this season and the challenge for McLean and his players must be to translate those encouraging periods of play into 70 minutes hurling.